Description: Honest police officer Hanuman Prasad Singh lives like friend and family with a magician by the name of Ramesh Kumar. Hanuman's wife passes away after giving birth to male twin babies; upon finding out that Ramesh's wife, Devyani loses her child and is render barren Hanuman decides to give one of his sons to Ramesh. Unfortunately Ramesh passes away in the midst of performing a stunt while entertaining his audiences leaving the child to be brought up by Devyani who grows up to be Shyam; a magician like his foster father. While on the other hand inspector Hanuman is falsely implicated by the corrupt Assistant Commissioner of Police Sharma and Daku Shaitan Singh for stealing huge number of gold bars. When Hanuman attempt to clear his name by bringing the real culprits to justice he is killed by Shaitan Singh; when his son heard of his death he goes to a temple of Bhagwan Shri Hanuman and pleads to him only to receive a boon with immense strength to fight for people who are subjected to injustice at the hands of tyrants so much that years later he is regarded as Toofan by his village people. Toofan's motive in life involve to clear his father's name by retrieving the stolen gold and at the same time bring the real culprits to justice while Shyam's motive is to perform the stunt that killed his foster father.Honest police officer Hanuman Prasad Singh lives like friend and family with a magician by the name of Ramesh Kumar. Hanuman's wife passes away after giving birth to male twin babies; upon finding out that Ramesh's wife, Devyani loses her child and is render barren Hanuman decides to give one of his sons to Ramesh. Unfortunately Ramesh passes away in the midst of performing a stunt while entertaining his audiences leaving the child to be brought up by Devyani who grows up to be Shyam; a magician like his foster father. While on the other hand inspector Hanuman is falsely implicated by the corrupt Assistant Commissioner of Police Sharma and Daku Shaitan Singh for stealing huge number of gold bars. When Hanuman attempt to clear his name by bringing the real culprits to justice he is killed by Shaitan Singh; when his son heard of his death he goes to a temple of Bhagwan Shri Hanuman and pleads to him only to receive a boon with immense strength to fight for people who are subjected to injustice at the hands of tyrants so much that years later he is regarded as Toofan by his village people. 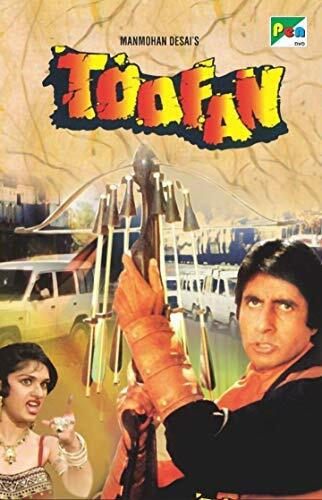 Toofan's motive in life involve to clear his father's name by retrieving the stolen gold and at the same time bring the real culprits to justice while Shyam's motive is to perform the stunt that killed his foster father.